Blood pressure, serum concentrations of sodium, and the production of urine are regulated by the renin angiotensin aldosterone system. This system also has an important role in the development of high blood pressure. Because it is now possible to modulate the activity of many of the enzymes involved in this system, it is important for veterinary students to have a solid understanding of this material. 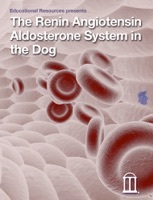 Consequently, this interactive book was developed to help make learning about the renin angiotensin aldosterone system both enjoyable and applicable to small animal practice.